Ask fellow campers about "Montgomery Bell State Park" and nearby attractions. We camped here Sunday October 7th through Tuesday October 9th. Campground was almost full capacity due to fall break for kids. There were park employees always close by working on something. The rest rooms/showers were cleaned twice everyday we were there. Even with all the families there, there was never a issue with noise before or after quite time. When we checked in on late Sunday afternoon there was 3 people in the check in station. The camp road is a little tight for some larger rigs but not impossible. There is also a great play area for kids. We camped creek side and listening to the water running over the rocks was very relaxing. Also had lots of fun catching very small bass and blue gill in the creek. Lots of deer, squirrels and other wildlife running around We camped at Montgomery Bell State Park in a Tent Trailer. Dickson is 6 miles to the West and has tons of restaurants, Walmart, Lowe's, tractor supply and a Chappels grocery store. It's a very nice store. White Bluff is 3 miles to the east. It has a Chappel grocery store and a McDonald's. If you like Greek food, Gus's gyros in Dickson is awesome. Where oh where are my ear plugs? Quite hours are not enforced!! We traveled here for an event nearby, so we made our reservations very early to ensure a spot for our 35 ft. TT. The campground office was closed when we arrived on a Friday at 2:00pm. Since we had not stayed at this CG before, we didn't know the road to our site. There are lots of family groups here, making for a loud party all day and into the night. Sites are extremely close together. And many sites have no grass, gravel only...not good for dogs.. The park needs to hand out equiette tips for the campers as many do not know that it is rude to walk thru your campsite. I'm am very disappointed in this campground and would not stay here again. We camped at Montgomery Bell State Park in a Travel Trailer. Older very pretty campground and we loved it. We had a beautiful and spacious site looking onto a beautiful creek and we slept to the sounds of water rushing over rocks. The campground was very busy with about half the campground full and all the sites with sewer so I recommend reservations. Most of the campers were locals and many had big dogs. We love big dogs so it was not a problem for us. The two handicapped camp sites were exceptionally nice and wide. We camped at Montgomery Bell State Park in a Travel Trailer. Nearby White Bluff has two hardware stores that offer RV supplies and propane refills. We were really impressed by the beauty of the park - just awesome. The sites were nice, although the picnic tables could use a little TLC. The restroom/shower facilities do not have AC, so there was evidence of mold/mildew and both the shower and toilet facilities were not up to current standards. We were only able to stay one night. We would like to return and be able to really explore the park. Good spot to come in the spring or fall. 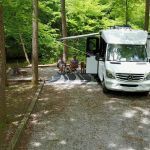 We camped at Montgomery Bell State Park in a Fifth Wheel. Tight roads. Spaces can be difficult to back into. We camped at Montgomery Bell State Park in a Fifth Wheel. Very nice park close (about 30 miles) to Nashville. One of the few low cost options when visiting Nashville. There are three bath houses. One was somewhat small (and I think older) but all three were very clean. Water flow was low but acceptable. Park rangers came by often and were very friendly. This keeps the "un-desirables" out of the park. I think local home school children used the play ground in the afternoon. The cross country running team was running when we were there. They were VERY well behaved and created no problem. The site #17 was long enough for us to back in, but a number of the sites could be somewhat difficult to get into with the trees and we would have had a problem if the site across the road from us was in use. There were a large number of big rigs at the sites with sewer connections. Sewer at some sites for extra $. Dump station, but no fresh water at dump station to fill up. Only "dirty" water to wash down spills. As with all TN state parks, only approved (fire dried) fire wood is allowed. 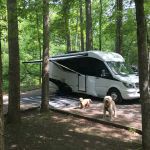 We camped at Montgomery Bell State Park in a Fifth Wheel. We had a creekfront site. We knew ahead of time the sites would be close together, so it wasn't a surprise. Level lot. Poorly position campfire ring. We didn't use the bathrooms but they were buggy and needing updating. Playground equipment out of date and all aluminum which isn't ideal in Summer. It's a good place to go that is an hour from Nashville, so we'll be back in the fall for a short trip. Strangely, there were a large number of flies. We've been camping throughout middle Tennessee and haven't encountered as many as we did here. We camped at Montgomery Bell State Park in a Travel Trailer. Kids eat free for lunch on Sundays at the state park restaurant. It was a good southern fixins buffet. We loved this park! We went to the website ahead of time and chose our spot based on the map, site dimensions/description and photos. Loved that they had photos...really helped us select the perfect site. We reserved ahead an paid just under $41 total, including day use fees. There campground has lots of trees/shade (not satellite friendly), a river, is easy to navigate, beautiful scenery, clean restrooms, and the campsites were incredibly wide/large with plenty of space cushion around so we weren't on top of our neighbors. Our site had hookups and was hard packed gravel/dirt. The park was fairly crowded on June 1, and the ranger came along that morning around checkout time to make sure we were vacating our space so they could ensure the next person wouldn't find us still there. Fair enough. We had a premium spot on the river, but it was more for ambiance as the flow was practically nill, so the river was a bit sketchy looking. We had our dogs on 15 - 20 foot leads and they enjoyed plenty of room on our site without encroaching on neighbors sites. The other campers we met were friendly. Lots of kiddos riding bikes and having fun, and we didn't encounter loud, obnoxious campers at night. I would definitely recommend this beautiful park and would not hesitate to stay here again...only wish we'd had more time here to chill and enjoy the nice weather (June 1). We camped at Montgomery Bell State Park in a Motorhome. We stayed 3 nights at the park. It was clean and everybody was very nice, although there was no attendant so there was nowhere to buy firewood. It was less than an hour to Nashville and also less than an hour to Franklin, which is a cute little town! There was a large field for our dogs to run in, we were able to let them do so because there were few people there at the end of December. My folks came in a big rig, and they were unable to access the back spots, but a friendly Ranger came by and let us all upgrade to a full hook-up spot and waived the $5 upgrade fee. We camped at Montgomery Bell State Park in a Fifth Wheel. Check out Franklin! We fell in love. Very helpful staff, great park, beautifully maintained. Saw deer, wild turkey and other critters driving though the park. Was a little hard to find the actual campground. The Inn at the park serves good food, buffet breakfast, lunch and dinner for a reasonable price. We camped at Montgomery Bell State Park in a Travel Trailer. Backing into the site was a little tricky. True with many here. Local town, Dickson, has everything you might need. The space they assigned us was horrible to back in. The park was nice and the grounds were beautiful. The staff really needs to evaluate the spaces they assign. I had to jump my front tires over 6 X 6s in order to back in the space. Lots of people at the park during our stay. We camped at Montgomery Bell State Park in a Fifth Wheel. Just an overnight stay, second time in the last year. The campground is clean and seems well maintained. The one bathroom I checked out was clean and orderly. The roads in the campground are quite narrow and twisty. The sites ate quite close together and the trees don't appear to have been trimmed. We woke to something falling on the roof and found, next morning, two large limbs had hit us. My one negative is the price: $20 for electric and $30 for full service in a state park with no amenities is darned pricey. We camped at Montgomery Bell State Park in a Motorhome. Great State Park to visit. Close to town, yet rural setting. Something for everyone in family to do. We camped at Montgomery Bell State Park in a Fifth Wheel. A little tight for longer units. Well maintained and clean. Great place for kids. All types of campers. Very quiet. Nice stream runs through park. Very crowded with very little room to back in or pull out. Cars parked everywhere. Was a foot off level from front to back. I saw pets but have no idea on their policy. I noticed trash around the park. It was a holiday weekend but I expected better. I would stay in a parking lot with no water and electricity to keep away from this place. We camped at Montgomery Bell State Park in a Travel Trailer. The park was great for family with children. Parks large baseball, and field for all types of games. A stream that kids could play in. No WiFi nor cable. We camped at Montgomery Bell State Park in a Motorhome. The site provided, person to hold games for the children . And a movie was provided for everyone. Short drive to a restaurant and Inn on the property. There is a great restaurant at the Inn. The Fri seafood buffet and Sat steak buffet were very good and reasonably priced at $15.95. Our friends payed golf and reported that the course was good. Walmart, Kroger, Lowe's and Dollar Tree in Dickson- 25 min. drive. Publix, Home Depot, TJMaxx, Walgreens in Bellevue- 35 min. drive. Watch your speed driving thru small town of White Bluff and Pegram-several deputies out. Are you affiliated with Montgomery Bell State Park ?